If you do not prefer any of the exciting activities that Los Roques has to offer or if you plan to take a break from your daily activities at Los Roques, you can skip a day and relax on a cruise through the beautiful calm sea. The sightseeing will be astonishing as you will get go to nearby islands, which have remarkable scenic views. 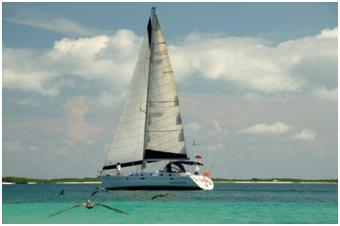 You can charter one of the many available boats that sail at Los Roques for the purpose. ÔÇÿSailing RoquesÔÇÖ has designed special cruise packages to suit your budget. With the sailing yacht ÔÇÿSoltana,ÔÇÖ they offer short trips to all the islands in close proximity of Gran Roque, the main island. The staff at Sailing Roques can make arrangements for your travel to and from Los Roques. They offer their help in booking flights and welcome you upon your arrival at Gran Roque. You can either take a domestic flight from Caracas to Los Roques or take a cruise ride, which will give you the real pleasure of travelling in sea. Once at Los Roques, you will get to visit many of the uninhabited islands surrounding the main island. Due to its geographical location just near the equator, the weather in Los Roques is mild and warm throughout the year ÔÇô making it the perfect place to cruise a boat. The islands are provided a natural shield from cyclones and sea storms by the coral reefs that surround them. Sailing Roques offer three sea tours. First is the ÔÇÿrelaxing sea tour,ÔÇÖ which is their classic route offering overnight stop at amazing bays. You can enjoy the moonlight on the deck or bonfire at the beach. Captain of the boat, who has in-depth knowledge of Los Roques, will take you on a tour of the island. You can enjoy cruising at its fullest. The second tour is ÔÇÿfishing lovers tour.ÔÇÖ This tour is dedicated to fly fishing so you can hook fishes while you sail through the clear blue sea. Los Roques is known for its fishing experience, as hundreds of people come here annually for this activity. Third tour is ÔÇÿopen seas tour,ÔÇÖ which takes you to more places than just the close islands. You travel to Margherita island via Tortuga. With high waves and fast strong winds, you will feel like a sailor. All your tours will be comfortable as the sailing boat ÔÇÿSoltana,ÔÇÖ is spacious and laden with quality interior. It has four cabins with private baths to accommodate 8 people. Privacy is ensured on the ship as the crew of the boat stays in the forecabin. The large sail area of the boat ensures smooth sailing and easy navigation. Sailing Roques is the right pick for the perfect sea cruising.